What Else Can I Do to Make Microneedling Worthwhile? In the UK alone, over 31,000 people elected to undergo some level of plastic surgery last year. Most of the treatments administered are, in some way or another, aimed at helping patients to look and feel younger. Between crazy facial treatments like the bee venom and vampire facial, it’s hard to keep track of what crazy new things can actually bring the results patients want! And the truth is, many of these treatments just… don’t work. There are loads of super-invasive, super-ineffective treatments that claim to help reduce the age of patients’ skin. But a new wave in cosmetic skincare–called “microneedling”–is equal parts not-invasive and super-effective! If you’re into the idea of younger-looking skin and are seeking a treatment that’ll really do the trick, microneedling may be just what you’re looking for. To learn more about microneedling, what it is, and how it can make you look and feel years younger, keep reading! Before we get to the specifics, it might help to know…uh…well…what even is microneedling?! Microneedling is a facial procedure that falls in the same general family as Botox and the vampire facial–but it’s actually way less invasive than most other clinical facials. Microneedling is also known as “collagen induction therapy,” and is a quick cosmetic procedure that’s used to target wrinkles, lines, and other signs of aging. To perform the procedure, a trained clinician will use a tool made up of loads of tiny needles that poke the surface of the skin all over. Seems a little silly, right? After the age of 30, our skin loses an average of 1% of its total collagen each year. This means that the stuff that keeps our skin tight and elastic starts…going away. When skin undergoes microneedling, however, those tiny needles that prick you all over help to break down old and underperforming collagen cells, promoting new and stronger collagen and elastin to grow back in its place! By replacing your skin’s current collagen, microneedling helps give your skin a more fresh and youthful look, and actually helps slow down the overall decay of collagen in your skin by keeping it fresh and on its toes! This all sounds pretty good, right? Now, you might be wondering about all the stabbing and breaking down that goes on with microneedling treatments–what’s that really like? Your microneedling treatment will be an in-office procedure that you’ll want to set up well in advance of when you’ll actually want to have it done. Although microneedling is a very low key treatment, it’s important that you prepare fully in advance. The microneedling treatment itself typically lasts for 20 to 40 minutes. Your clinician will start the process by washing the skin and applying a serum. Typically, they’ll begin microneedling on the forehead or temples, as this area is often the most sensitive of the whole process. The level of discomfort most experience during the procedure has been likened to a significantly more-intense version of eyebrow tweezing, with discomfort skyrocketing around the bonier areas of the face, like the forehead and chin. Microneedling isn’t necessarily something you should do if you’re just looking for a nice, relaxing afternoon activity–but it’s also nothing to rival childbirth or the pain of the alarm clock going off too soon. Once your entire face has been treated (your clinician may run over problem areas like smile lines or crow’s feet several additional times to ensure effective penetration), another serum will be applied. As with any cosmetic treatment, you’re probably wondering just what you’ll get from letting somebody stab you repeatedly all over your face with tons of tiny needles. That’s pretty reasonable. Immediately following each microneedling procedure, you’ll probably notice that your face looks a little flushed or somewhat sunburnt. This is totally normal and will only last for a few hours afterward. 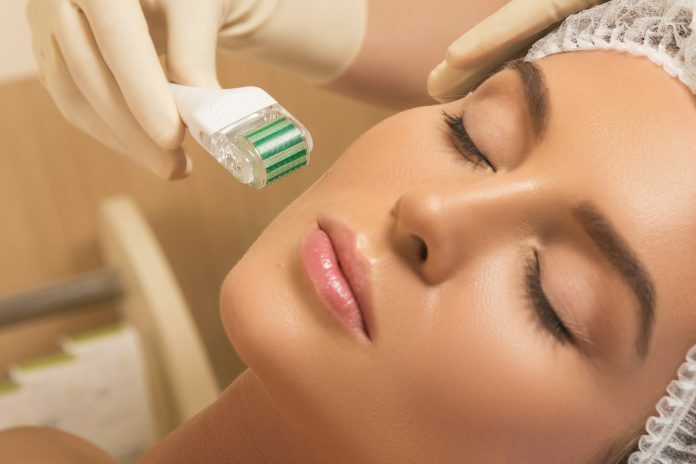 It may not be a great idea to get a microneedling treatment the morning of your wedding, but you’ll definitely be cleared up for work the following morning. Some patients also experience some really minor spotting or scabbing in the first days after their microneedling treatment. This is actually a good sign that your skin is already working hard to replace its old collagen. A solid exfoliator can be used to take care of any minor scabbing. One of the only drawbacks of microneedling is that you won’t necessarily notice any obvious improvements immediately following your first treatment. Most patients set up a plan to receive 3 treatments over the course of 4 months. The results of microneedling are cumulative, and the only way to get the best results is to stick with the treatments. If you’re patient enough to stick with your microneedling treatments, you’ll start to see super noticeable improvements after the second and third round. If you decide to go through with the microneedling treatment, there’s no doubt you’re in for some super-satisfying results–but there are some things you can do, in addition to the treatments themselves, to maximize the outcome of your microneedling procedures! Many doctors and dermatologists recommend that patients use products like SkinCeuticals’ Epidermal Repair serum in the weeks following microneedling to help moisturize and promote regrowth of the skin’s collagen. Some doctors also suggest SkinCeuticals H.A. intensifier or Isdin Flavo C capsules, which help to hydrate and plump skin after the treatment. In addition to topical products like this, many dermatologists and clinicians recommend further clinical facial treatments following microneedling, like professional chemical peels. In-office peels should be done 4-to-six weeks before and after the microneedling treatments for best results. If you’re excited about how easy and effective the microneedling process is, we aren’t surprised! Consider calling your local dermatologist or cosmetic surgeon to discuss whether or not microneedling is right for you. In the meantime, stop by and check out the rest of our awesome lifestyle and beauty content!